Hi everyone! I'm so sorry for the lack of post during last week. My father-in-law got a stroke on Tuesday morning after playing badminton and fell down during the game. Nothing happened when he was in the badminton court until he arrived at home, suddenly he couldn't speak at all. He tried to call my brother-in-law with an unclear voice. My brother-in-law was already on the way to his office and he immediately drove back home, picked up my FIL and brought him to the hospital. My husband went to the hospital directly from the office. I was in shock too because my FIL was very healthy and very active. My husband and my brother in law took turn to spend the night at the hospital. Yesterday after lunch time, doctor said my FIL could go home. A lot of improvement after day 2 in the hospital. Now, he will need speech therapy and motoric therapy for his right hand and foot. Thanks a lot to friends on twitter, who read my tweets ... Thanks a lot for all the supports and prayers. Really appreciate it! Today's bento was very simple (hope tomorrow I can do a better one). I made the flowers from egg and crab stick. Put them on the top of the rice and made flower shapes carrots as baran around the rice. Since this month theme for BOMB challenge is Flowers, I think this bento is qualified to be entered into BOMB challenge. You can read the details from Debra's blog, Hapa Bento. Please join this fun event! Inside the box : rice topped with egg and crab stick flowers, sauteed Chinese okra with egg and tofu, and sauteed Weisswurst sausage with onion. Glad to hear that your FIL is recovering well. That's a very flowery bento. :) And oh boy, you have just reminded me about BOMB! Lia, I'm so glad that your FIL is recovering so well. That entire event must have been pretty scary. Just a few weeks ago, my boyfriend's mother suffered a minor stroke and we were pretty shaken up by the entire event. I somehow missed your tweets about your FIL :( I am very glad to hear he is doing better! We will pray for his continued recovery! Love your pretty flowers, perfect for BOMB! So glad your FIL is doing better! So glad to hear your FIL is on the mend! Keep the faith! Praying for a complete recovery for your FIL. Hope you and your family are doing well after such a stressful time. Lia your bentos always look so lovely despite everything! No wonder your "HOME" is locked for few days, thought you were busy with your kids exam and new house. Hope your FIL will get well soon. So glad that your FIL is recovering so well. Lovely bento with all that cute little flowers. Sorry to hear about your FIL but the good thing is that you caught it quickly and hopefully his recovery won't be too long. Phew! @Anncoo : Thanks a lot Ann for everything! Hi Lia, Really sorry to hear about your FIL, sending best wishes, thoughts and prayers. Comment from Pauline (Pipaw) via e-mail : All these flowers look gorgeous! I don't know how you manage to make such beautiful bento everytime, especially after such a difficult week end (I have been reading your blog for a few months but I am a shy person so it took me time to leave messages!). Hope your FIL recovers well. Hey LIa Chen, glad u r back and hope ur FIL is as fit as previously soon. 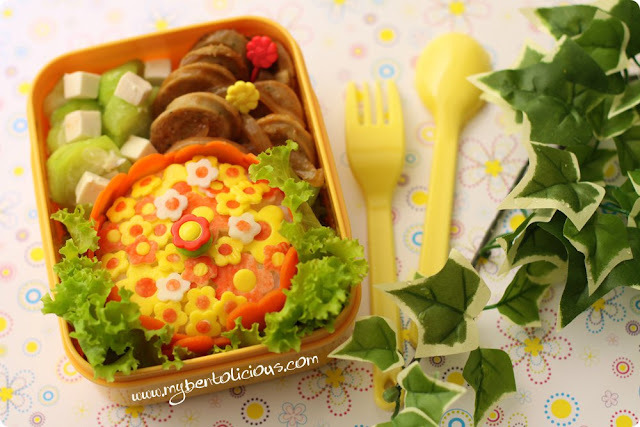 A simple yet beautiful flower bento u made, cheer up! Hey Lia, you are back! Hope your FIL has a speedy recovery! All best wishes for your FIL's quick and full recovery, Lia! Another lovely bento full of delicate good cheer, thank you for brightening my day with it! that explains the absence of yr bento post...miss it really.. So sorry to hear about your FIL; glad he is doing better! We hope he continues to heal healthfully. Praying for a complete recovery for your FIL. Worry to heard that you loss weight, take good care of yourself more ya. Hi lia, I missed your blog . Thought you were busy with your kids exam. Glad to hear that all is well and you are 'back'! Yummy egg flowers . Almost too arty to eat! @mr. pineapple man : Thanks a lot for your nice comment! i am so happy to hear your FIL has improved... what a relief, and i wish him continued recovery! nice that you got away for a quick show with your hubby, too. I wish your FIL a speedy recovery! @Rachel : Thanks a lot Rachel! Very appreciate it for your prayer :) He is getting better bit by bit. a bit late in my comments, apologise. hope your FIL is feeling better by now.